This is a pretty exciting thing for me. This coming Wednesday, August 3rd, at 6pm, I am going to be co-hosting a Twitter Party with Brian of The Gringo Chapin. What is a twitter party? Well, it is a set amount of time where people tweet on any giving subject using a hashtag. The hashtag for our event is #crockpotwed. And no, it is not themed crockpot weddings….it is Crockpot Wednesday! Brian and I will be moderating the chat to discuss all things crockpot cooking. So join us to get tips on what to use your crockpot for in the summer, share your recipes, and make new “friends” on Twitter! In addition to the chatting fun, we will also be giving away some prizes! You can see those details below. You can follow the chat even if you don’t have Twitter, by following this webpage. But you do have to have a Twitter account if you would like to chat back. Also, make sure you are following me on Twitter, as well as Brian, and this week’s sponsor, Harvard Common Press. If you are interested in sponsoring an up coming #CrockpotWed, or co-hosting an upcoming Twitter Party, email me! Here are all the fun details for Wednesday’s party…. Join us for the first #CrockPotWed chat! Connect with fellow foodie on twitter, pick up some great Crockpot cooking tips, and win great prizes! 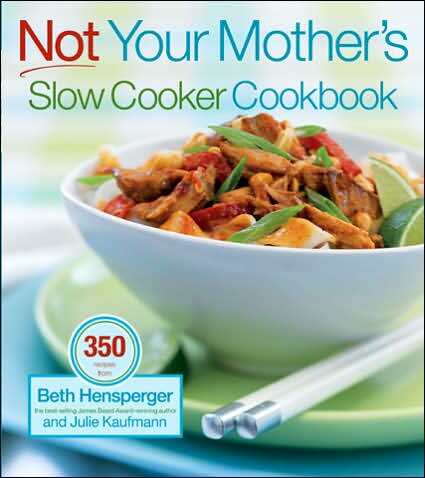 We will be giving away 4 copies of Not Your Mother’s Slowcooker by Beth Hensperger, Julie Kaufmann courtesy of Harvard Common Press. Winners will be chosen at random from all who tweet using the #CrockPotWed hashtag any time before 6:55pm on Wednesday, August 3, 2011. This twitter party will be moderated by Renee (@renh77) of Eat.Live.Blog, Brian (@thegringochapin) of The Gringo Chapin and Adam (@hcpdishes) of Harvard Common Press. Follow one, or all of us on Twitter, and answer the questions as they come! Follow the entire chat here in order to converse with the other participants! Share your crockpot ideas, questions, recipes….anything slowcooker is fair game! At 6:30pm and 7:00pm, we will announce winners of the cookbook! Questions about the Twitter Party? If you have any questions about this party, or if you would like to sponsor a future #CrockPotWed, please contact Renee. This entry was posted in Random and tagged beth hensperger, blog, cookbook, crockpot, harvard common press, julie kaufmann, not your mother's slowcooker, recipes, slowcooker, sponsor, twitter chat, twitter party, twitter party host by reneeh. Bookmark the permalink. Very cool idea, though I can’t make the “party” 🙁 I use my crockpot year-round – hot summer days are no exception! I love that you guys are doing this. thrills me to pieces. @Lexiquin hopes to be there–thanks! Thanks for joining tonight Martina!